American Idiot tells the story of three friends from lower-working class backgrounds who feel suffocated by their small town, and escape to the city in search of bigger things. Set in a time of political strife in the US, American Idiot lays its foundations in the doubt and uncertainty that characterised the USA post-9/11. Lost and lonely in ‘a world of make believe’, the three characters lives are intertwined with the politics of this complicated period of US history. Green Day’s music is the thread that ties the story together; with all of the songs from the musical’s namesake, and a few featured songs from the band’s follow-up album, ‘21st Century Breakdown’. American Idiot is story-driven, and features a full cast of lively characters. The energy on stage was raw and angry; decked out in early 2000’s punk attire, the cast felt authentic and of the time. Within the set design (Sara Perks) the stars and stripes of the US flag were found everywhere, even as Johnny (Tom Milner) and the ensemble sang about their loss of American identity. Siobhan O’Driscoll’s professional debut as Heather, a young woman who becomes pregnant unexpectedly, was both heart-warming and poignant opposite Samuel Pope (Tunny), who leaves his friends to be a father. Unlike his friends, Tunny stays behind in the ‘suffocating’ town, and Pope was confined to a specific section of the stage throughout the show to reflect this. Despite this, his performance couldn’t have been more dynamic, and together with O’Driscoll, both actors perfectly encapsulated the struggles of a high-stakes relationship. Tom Milner shone in the lead role of Johnny, epitomising the raw punk-rock energy of the original album and commanding audience attention whilst on stage. Milner’s performance as Johnny echoed the style and charisma of Green Day’s lead singer and lyricist Billie Joe Armstrong, making the musical feel more like a concert than a performance at times, especially during the band’s famous single ‘Boulevard of Broken Dreams’. This concert-like atmosphere further broke down the barrier between the political themes of the musical and the lives of the characters. The audience were made to feel a part of the system that Johnny et al were victimised by. This was especially clear towards the end of the performance where the cast came together as one to direct their words to the audience. Lively, vibrant, and exciting, American Idiot deals with heavy themes in a way that doesn’t pull any punches. The cast were unapologetic in their portrayal of struggle and lost identity, stuck in the space between ‘insane and insecure’. 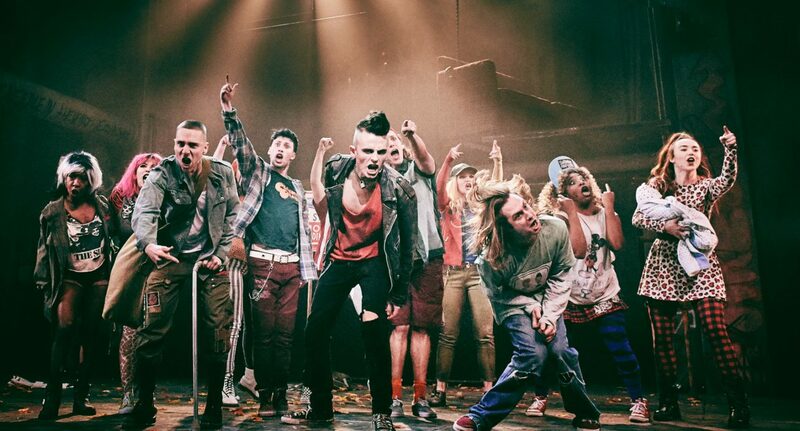 American Idiot sees the personal meet the political in a way that is representative of the punk movement, bursting with energy and rage in a true homage to Green Day’s original album.